Want to get your hands on a gorgeous swimsuit or coverup from Storm in a D cup, one of the most stylish curve loving hot collections of the season? Well, here’s your chance to receive a $200 Gift Card and get what you love for FREE! I chose one of the styles that had just arrived. A blue bikini with a non-underwired halter top that has a trademark construction which offers incredible support, a beautiful neck line combined with the softest lycra ever and stunning gold toned hardware. 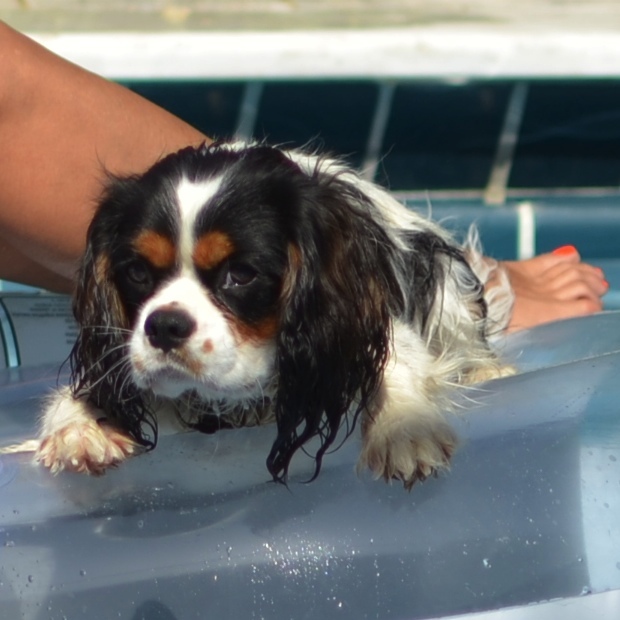 AF took some pictures in the pool with Spot, our baby cavalier King Charles that looooooves swimming and photo-shoots. I am sure you will be impressed by the Storm in a D cup glamorous and stylish swimwear. It flatters every figure. 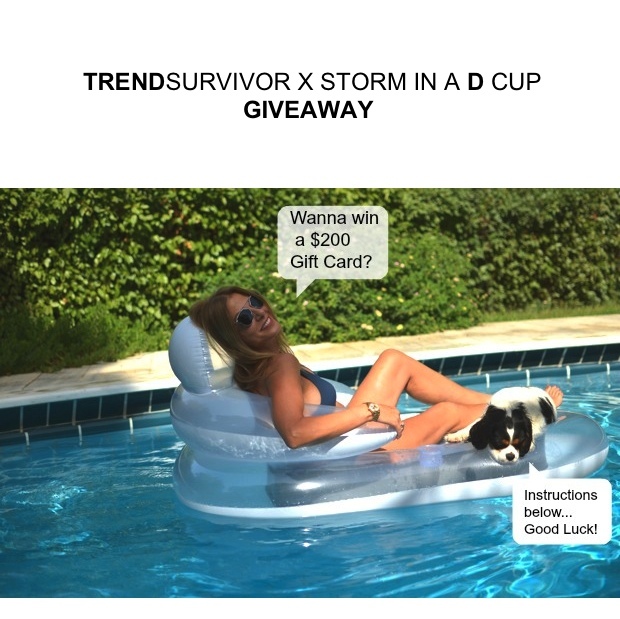 You can be the lucky winner to get $200 Storm in a D cup Gift Card to spend on whatever you like at their online store with one step! However, I will give you some more options because each one increases your chances to win. Sign up here to receive Trend Survivor newsletter and join Storm Beach Club for Swimwear news and exclusive offers. The international giveaway ends September 17, 2014 at midnight. The winner will be announced on the blog, facebook and twitter. Don’t Miss Out! Good Luck! Have been following your FB page and blog for a while now and love all. I look forward to my daily “fix”. Keep up the wonderful work! Oh! Thank you Tina !!!! Good luck! Storm in a D Cup! Just the thing! I really like the Coral Balconette Top! Love that swimsuit and your puppy is too adorable! If I win I would like to get this one: http://www.storm-in-a-d-cup.com/collections/ba/products/4615-foil-vanilla-balconette and also the low part. OMG! The butterflies are so cute! Good luck!!! WOW! This is amazing, love the mint color…Good luck! 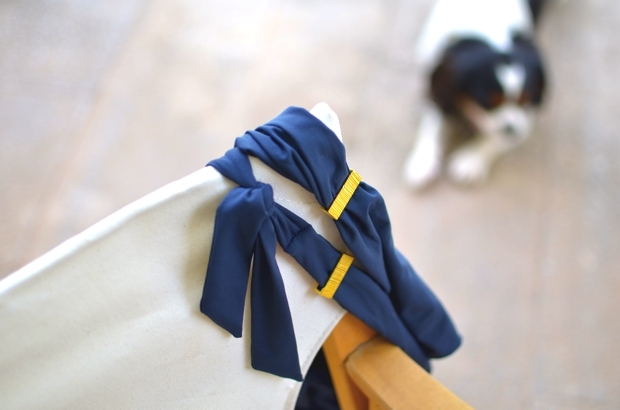 That swimsuit looks gorgeous and how cute is your pup!? Stopping by from the link up! Thanks Darcy and good luck!!! I would get the one piece disco halter. http://www.storm-in-a-d-cup.com/collections/one-pieces/products/9623-black-halter-beaded-one-piece this is the one I would choice. I like the 9111 PYTHON MINT HALTER and matching banded bottoms. Hope you win it 🙂 Good luck! If I won I would love to pick up the 9201 MESH SHIRT PYTHON MINT with the 4617 FOIL TURQUOISE HALTER and 4609 FOIL TURQUOISE HIPSTER. What a great combination set! The mesh shirt will be amazing with the swimsuit plus you can wear it as a top! Good luck! I like the flutter mint bandeau! I would love to buy a bathing suit that fits and looks good! You might get one for free…:) Good luck! I love the 9104 PYTHON COCONUT GROVE MONOKINI – that’s what I’d pick! The Foil Smokey Quartz Halter One Piece is gorgeous. Hard to choose because they are all gorgeous!! They are specially made!!! Good luck my dear! That is such a cute bikini! And it’s so nice to see swimwear in larger cup sizes…it’s such a pain finding a top that actually fits properly and provides support. I like the obsidian halter. I totally agree 🙂 Good Luck! I wold love a nice two piece. I’d pick the banded bottom & probably the halter top. I would get the CO2 black shoulder one piece. Nice idea! Good luck my dear! Love the suit- you look great! your pup is so cute too! I like the 9104 MONOKINI SEYCHELLES. I would get the aqua halter top and the aqua hipster bottoms! So much fun! Thanks 🙂 Good luck ! If I won, I would get the halter twist in coral with matching hipster bottoms. Thanks for sharing this company with us- it’s so hard to find cool bathing suits that actually fit my chest. You look amazing! I love the yellow detail on it! I am in serious need of a new bathing suit! Thanks for linking up! WOW , the swimsuitis fab. & splendid. 2 fingers snap. Elvis has arrived. Thanks for the awesomeness, the contest, & generosity. Thank you Johanna and good luck! I would get 9201 MESH SHIRT FLUTTER MINT!!! Adorable one!!! WOW! you can wear it over jeans too. Good luck! I’d definitely get the swimsuit you wear in this post. Lovely! i cannot decide between those two one-pieces! 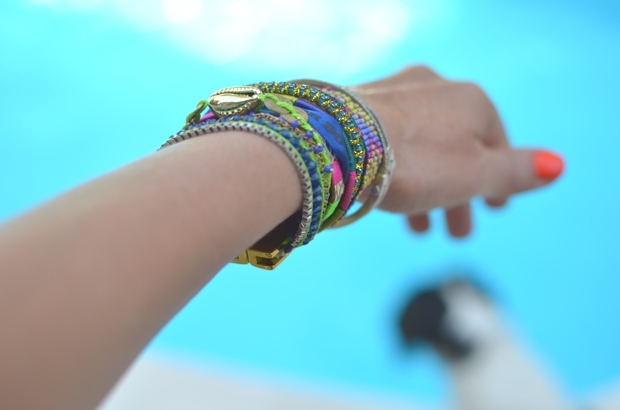 hmmm they are so different … the second one has amazing colors!!! Good luck! Awesome and gorgeous swimsuits for sure! Thanks for sharing this fabulous giveaway! I love the Black Halter Beaded One Piece for sure, but there are so many lovely pieces! I know if I won I would get the CO2 BLACK SHOULDER ONE PIECE!! i want the gold once piece halter!! Good luck Courtney 🙂 Thank you! Love the colors! Good luck! Although i have checked the site very well i think your swimming suit is the best of all! 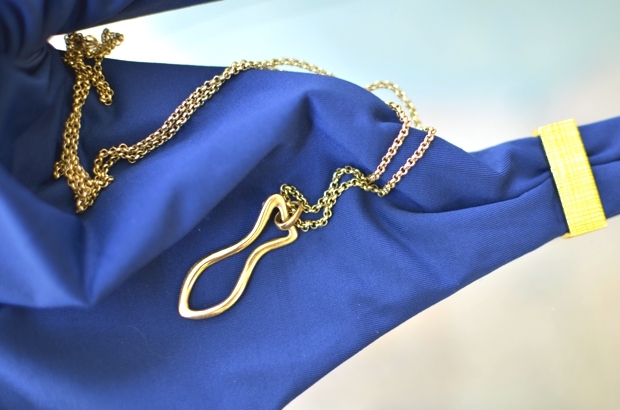 I love that specific blue colour and how it combines with gold elements!! It suites you very nice! !Nice photos! thank you! Thank you!!! 🙂 Good luck Veni!!!! Pretty suits! I would probably pick Obsidian Halter and matching bottom. I liked Trend Survivor on Facebook! My user name is Ali Gibbs. I also tweeted the message that is above the Rafflecopter! My Twitter handle is @alisong64. I would get the Monokini Gold and the Monokini Seychelles. I think I’d get the 9624 PYTHON MINT HALTER ONE PIECE. It’s not something I’d normally wear, but change can be a good thing. Hope you’re having a great weekend! I love your site <3. It has helped me a lot. I especially love "Hair Trends | Top 20 Upgraded Ponytail Ideas to keep cool"
Thank you my dear! Good luck!!! Who has been the winner? Thanks!